Have you ever wondered what you’d look like with a different eye colour? Because I definitely have. Despite only 2% of the population having green eyes, I’ve always been unhappy with my eye colour for some reason. I just feel like the colour of mine are quite dull and just generally uninteresting. I remember in secondary school meeting my friend Lois and being stunned by how incredibly bright and blue her eyes were (and still are). I think every colour is beautiful but I just wish mine were a little brighter and a more noticeable feature of mine! 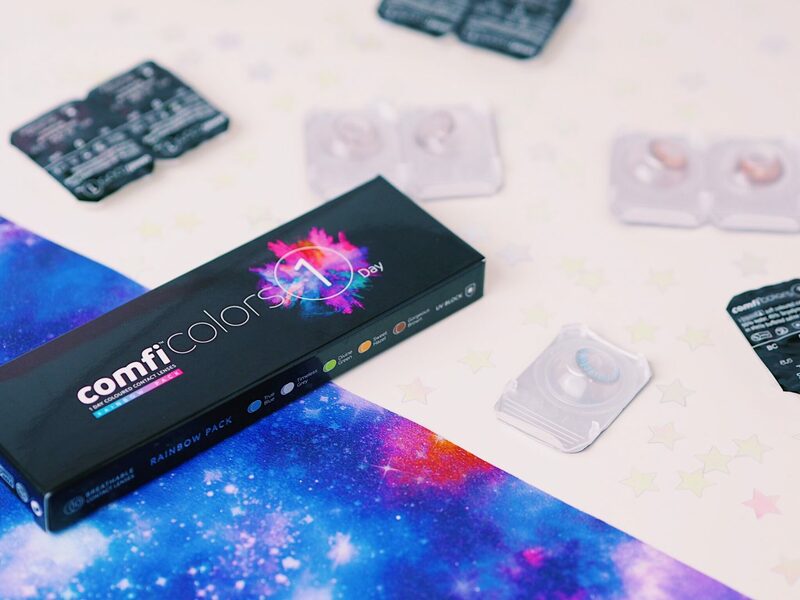 Luckily for me and people alike, Feel Good Contacts have recently released a multipack of 5 different coloured pairs of lenses called Comfi Color 1 day! The colours included in the pack are True Blue, Timeless Grey, Divine Green, Sweet Hazel and Gorgeous Brown. Once you find which colour is your favourite to wear and suits you best, you can buy them in individual colour packs so you can keep a good stock of them. This of course in no way is me saying you should change yourself or the way you look but isn’t it great fun to experiment? Just like changing your hair colour or trying a new makeup product to see how it works on you. How Did I Get On With Wearing Comfi Color 1 Day Lenses? I’ve tested a couple of the colours out so far and never realised how simple they would be to wear! As someone who’s never worn glasses or contact lenses (so a complete novice), Comfi Color 1 Day lenses were actually pretty simple to insert once I knew how to do it. A simple Google search helped me out! They’re soft so sit pretty comfortably on the eye and surprisingly didn’t cause me any irritation once they’d settled. I think the “True Blue” lenses have been my favourite so far which are the ones featured. Although “Timeless Grey” have been a close second. I’d definitely say I’m more of a cold colour lover which is why I think these have been my favourites. 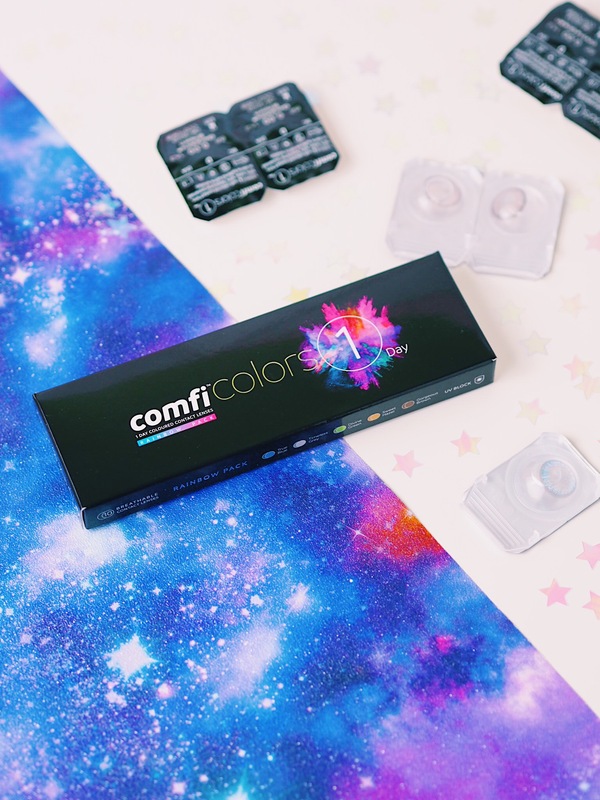 One thing I must mention is that you can also get Comfi Color lenses in a range of prescriptions so they aren’t just a fashion accessory, they are also practical for lens wearers! Feel Good Contacts are a website that save customers up to 50% on contact lenses compared to the high street prices. They stock an array of recognised lens brands such as Freshlook, Air Optix and many more. Aswell as this, they sell a wide range of eyecare products including eye masks, sunglasses, eye drops and contact solutions. Students can also get 5% off with them! 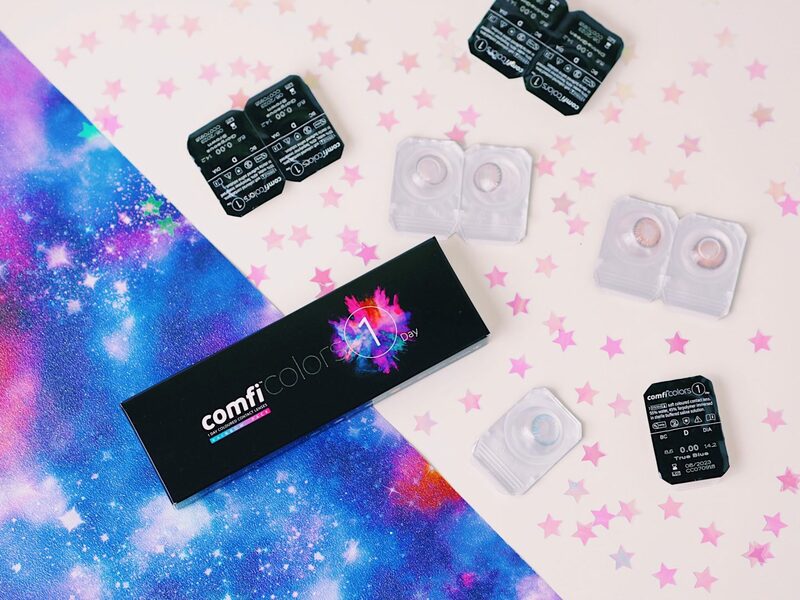 If you fancy grabbing yourself some of the Comfi Color 1 Day lenses or even some other bits from the Feel Good Contacts site, you can use my code BTBEAUTY10 to get 10% off of your first order as a new customer! Is there an eye colour you’ve always wanted to have? "Ideas For A Luxury Christmas Hamper!" "Sweet Pieces With Statement Made Jewellery!" Oooh these lenses are absolutely gorgeous! You look amazing! These lenses look amazing, and the blue ones you’ve photographed in this post really suit you. As someone who has green hazel eyes, I can complete relate to your struggles of wanting something brighter. As a kid, I always wanted bright blue eyes, or grey-blue ones like my younger sister, but alas, it wasn’t meant to be. Unfortunately I have an astigmatism which means I need more expensive, toric lenses that coloured contact companies often don’t cater for, or I’d be all over these. They’d be perfect for a night out, or special event! It really does! Yet when I mention it to anyway they’re always like “but there’s nothing wrong with your eyes; they look nice”. I hope they make specialist ones someday! I’ve ALWAYS wanted purple! Is there a purple? I don’t think so unfortunately, but that would be so bloody cool!